Pres. 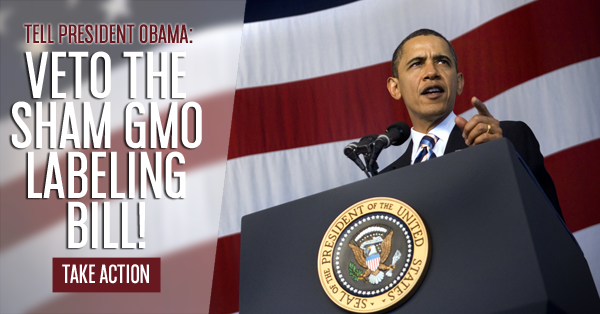 Obama: veto the sham GMO labeling bill! The U.S. Senate voted late last Thursday night in favor of a sham GMO labeling bill that will eliminate Vermont’s genetically engineered food and seed labeling laws. The Senate bill will leave a significant number of GE products unlabeled due to a definition of “bioengineered food” that even the FDA has called into question. Companies will also be able to opt out of clear accessible on-package labeling by using digital “QR” codes that will be unreadable by approximately half of rural and low income Americans without access to smartphones or cell service. Beyond all of this, there are no penalties for lack of compliance, and no authority to recall products that are not properly labeled. Take a minute and use our online action form to ask President Obama to veto this bill! The bill passed by the Senate is nothing but an industry giveaway, and we need to call on President Obama to veto it if it reaches his desk. The bill will now head to the House of Representatives where VT Congressman Peter Welch has pledged to do everything he can to try and defeat it. We don’t know what will happen in the House, and that’s why we’re asking you to write to the President urging him to veto the Roberts-Stabenow bill or any other sham GMO Labeling bill if it reaches his desk. In 2007, as a presidential candidate, then-Senator Obama said “…we’ll let folks know if their food has been genetically modified because Americans should know what they are buying.” Now it is time for the President to live up to his campaign promise and veto this legislation aimed at keeping consumers in the dark about what is in the food they eat and feed their families. With our allies across the country we have a goal of sending a million messages to the President. Please take a minute and contact the White House today! A GMO labeling law that doesn’t require labels? No thanks! On Thursday, two US Senators – Debbie Stabenow (D-MI) and Pat Roberts (R-KS) - announced that they had reached a deal on a national GMO labeling bill that would preempt Vermont’s labeling law set to go into effect on July 1st. This bill would delay labeling for up to two years while the Secretary of the Department of Agriculture develops rules for the labeling of genetically engineered foods. The Secretary would be charged with developing three options of disclosure including a plain language label, a symbol, and electronic or digital links accompanied by the wording “scan here for more food information”. Under the bill there are no penalties for lack of compliance, and numerous avenues for big food to negatively influence what the final requirements will look like. 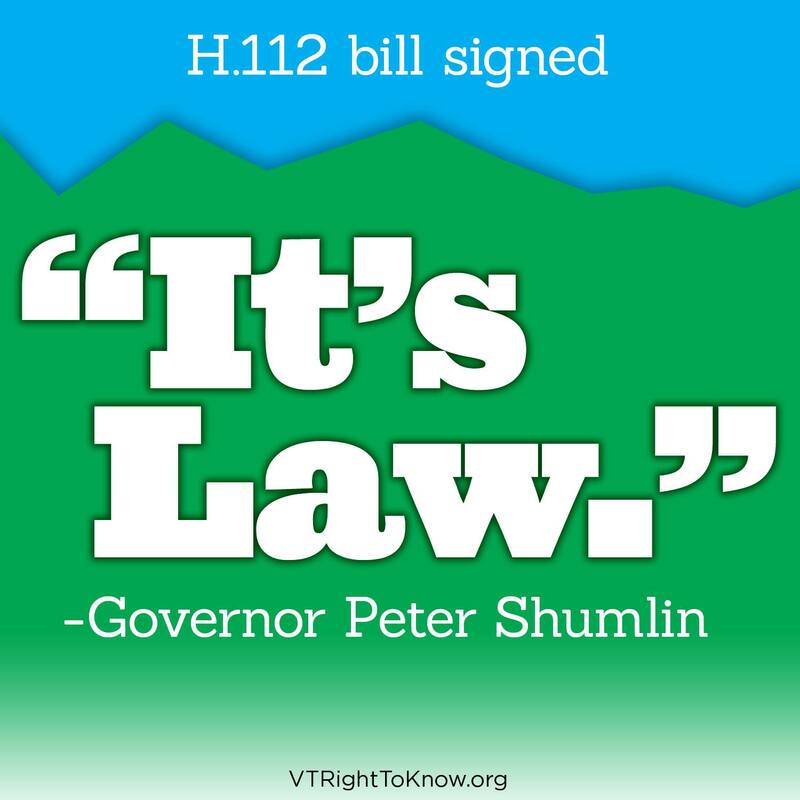 Whatever happens in D.C., it will not happen in time to stop Vermont’s labeling law before it goes in to effect on July 1st, but that does not mean Vermont’s law is safe. 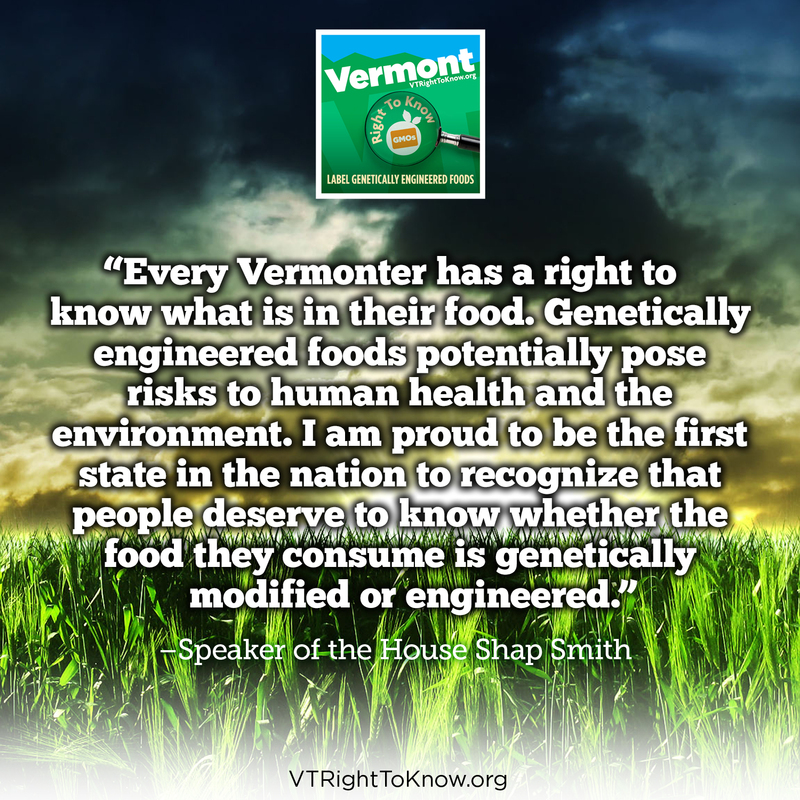 That is why the Vermont Right to Know coalition, Vermont’s political leaders, and advocates from around the country will be gathering on July 1st at noon on the State House lawn in Montpelier to celebrate Vermont’s law, and to call on Congress to stop the sham GMO bill backed by Roberts and Stabenow — and we hope you’ll join us! For more information on the bill see the resources below. A little over a week ago, proposals were made in the Vermont State House that would have opened up our GMO labeling law to several changes. Thanks to your calls, emails, and the work of our supporters, we were able to fight off the proposals that could have affected the law’s implementation! The budget does contain a provision that would delay a citizen’s ability to bring a lawsuit under Act 120 for one year, but it does nothing to stop the Attorney General from enforcing the law or push back the law’s start date. We will keep fighting in Vermont to make sure our law remains strong, and will let you know if we need more calls to fight back industry proposals. Unfortunately, once again we need to turn our focus to Washington D.C., where corporate food lobbyists continue to try to pass legislation to preempt Vermont’s labeling law before it goes into effect on July 1st. Big Food and Senator Debbie Stabenow are pushing a proposal to replace Vermont’s clear on-package labeling law with ineffective “QR Codes”. QR Codes are similar to bar codes and would require consumers to have a smart phone, the correct application, internet service and the time to scan each product and visit companies’ websites to find out if their food is genetically engineered. All of this to avoid putting clear labeling on food packages. 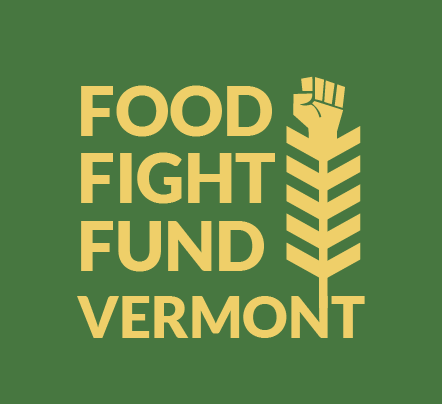 We are just months away from Vermont’s first-in-the-nation GMO labeling law going into effect, and we need your help to fight off this one last push from the big food lobby. 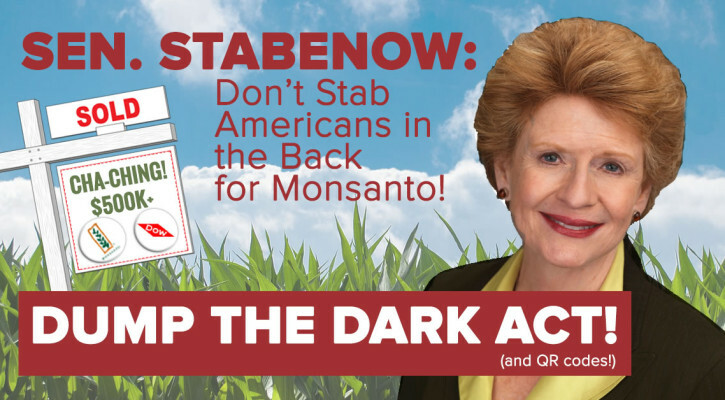 Please take a minute and join our friends at the Center for Food Safety in calling on Senator Stabenow to say NO to a QR code compromise. It’s now or never for our right to know. Senator Roberts’ despicable version of the DARK Act is going to the full Senate for a vote TOMORROW MORNING at 11am. 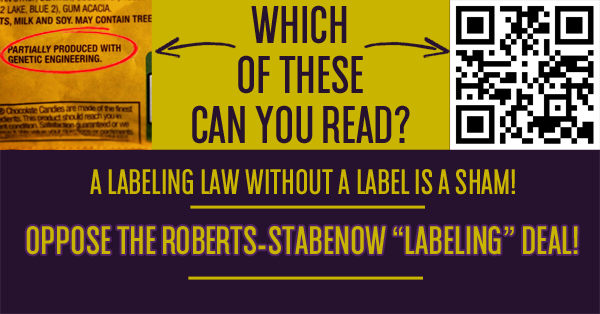 If passed, Roberts’ bill would not only seek to stop all present and future mandatory labeling of GE food (including Vermont’s Act 120) but also potentially rescind over 130 other state seed and food protection laws! Now more than ever, we need all hands on deck. The Senate vote is projected to be extremely close. 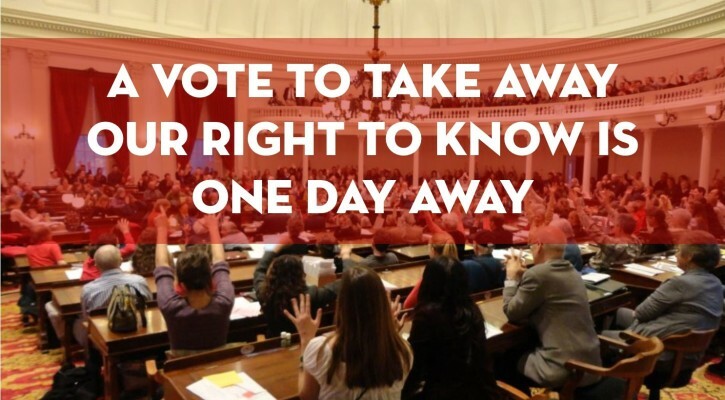 Since the Vermont congressional delegation is already supporting our right to know, we are asking you to help influence the positions of other key Democrats. We need you to make calls TODAY to the following senators, and forward this email to your friends and family in the following states! It’s truly now or never for your right to know. Polls show 90 percent of Americans support on package labeling of GMO food. More than ​​ 700​ ​ businesses and organizations oppose the DARK Act. More than 1.4 million Americans have joined a petition urging FDA to require labeling of GMO food. Farm groups ranging from the National Family Farm Coalition to Farm Aid to the National Black Farmers Association oppose the DARK Act. Chef Tom Colicchio and 4,000 chefs from 37 different states signed Food Policy Action’s petition opposing the DARK Act. More than 125 CEOs have written to Congress to oppose the DARK Act. GMO labeling will not increase food prices. Companies frequently change labels to highlight new innovations and GMO label will not act as a warning. There is no “patchwork quilt.” Current state GMO labeling laws are virtually identical, so there will be no “patchwork quilt” of different state laws. GMO crops do not feed the world. Conventional and GMO corn and soybean yields have increased at the same rate. What’s more, U.S. farmers produce only 4 percent of rice, wheat, fruits, and vegetables, and most U.S. corn and soybeans are mostly used for animal feed and ethanol, not food. Questions? ​Email maddie@nofavt.org. 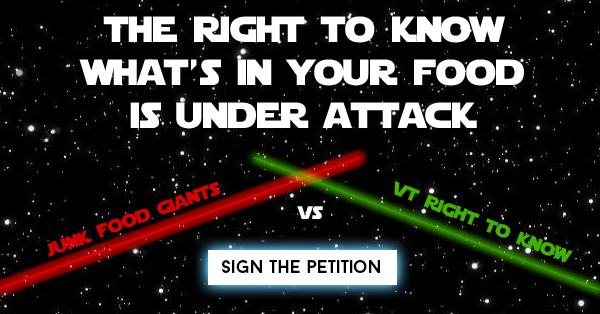 And THANK YOU for standing up for Vermonters’ right to know! Sign the letter: Tell the Senate to Reject the Dark Act – click here! The DARK (“Deny Americans Right to Know”) Act is back, and Vermont’s GMO labeling law is being attacked again. Thanks to persistent citizen action across the country we succeeded in stopping the DARK Act this winter, but with four months to go before our labeling law is fully implemented, it’s now or never – for both sides of this issue. In typical D.C. fashion, Senator Pat Roberts (R-KS), the Chair of the Senate Agriculture Committee, introduced the Senate version of the DARK Act late Friday and wants to vote the bill out of committee this week. This bill threatens not only Vermont’s GMO food and seed labeling laws, but it would codify our broken voluntary labeling system and stop any state or local government from passing future laws. Instead of siding with the majority of Americans and the 64 countries around the world that already require labels for genetically engineered food, some lawmakers are following industry suggestions to block state rights to inform their citizens. The new DARK Act is once again putting big-moneyed special interests above the public interest; corporate food and biotech lobbyists are racing the clock to push legislation through the Senate, in order to stop Vermont’s law from taking effect this July. Sen. Roberts’ version could in fact be worse than the original bill, as it also eliminates Vermont’s seed labeling law, which has required genetically engineered seeds to be labeled for years. Thankfully, Vermont’s federal delegation has strongly supported the labeling law, as well as championing efforts to create a federal mandatory GMO labeling standard. Now their colleagues need to hear that voters will not stand for this corporate power grab at the expense of the people of Vermont and our right know about the food we eat and feed our families. Over two thirds of our state legislators signed on to a letter urging Senators to respect the people of Vermont and our democratic process, and now it’s your turn. We expect that this bill is likely to move out of the Agriculture Committee before the week is over, so we need you to act now! Please take a minute to sign our letter and we will make sure to keep you updated as we hear more from Washington. On Wednesday January 7th the Federal District Court in Burlington will be hearing the first oral arguments on Vermont’s landmark GMO labeling law. The arguments will center on the State’s Motion to Dismiss the lawsuit, and the Plaintiffs’ request to stop implementation of the law. This is a major step in deciding if Vermonters have the right to know what is in the food they eat and feed their families. 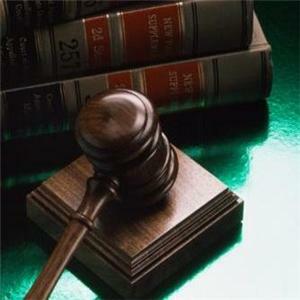 Find all the latest legal documents in the case to label GMOs. For those who would like to see the oral arguments, this is your chance. The arguments will be held in Room 542 of the Federal Courthouse in Burlington. They will begin at 9:30 and may continue for a couple hours. If you want to attend, make sure to bring your ID, and arrive a bit early if you want to be sure to get a seat. Space in the court room will be limited, and all spectators need to be quiet and respectful while the court is in session. Get directions to the Court House. After the oral arguments, the Judge will deliberate and issue a decision, probably within the next few months. We will make sure to provide updates after the hearing for those who cannot attend. This is an exciting moment in our struggle to label GMO foods, and it reminds us how far we have come in the last three years. 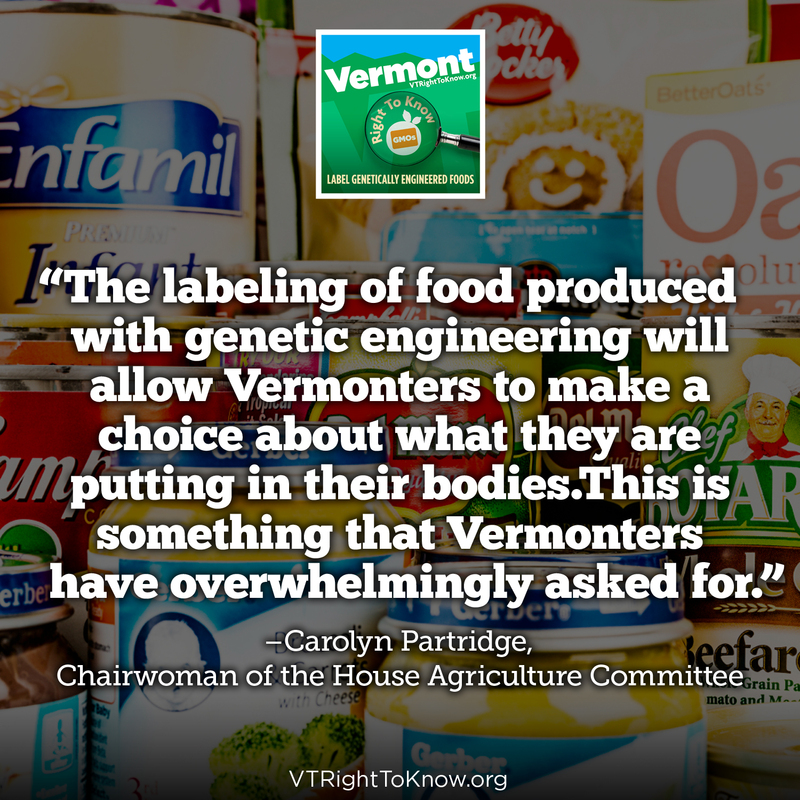 Vermonters should have a right to know about GMOs!